[0:07] <u-ou> can the 3 play youtube alright? [2:05] <AlexPortable> What would be the best way to hook up an existing doorbell to the pi? [2:07] <AlexPortable> and won't the voltage difference be bad? [2:07] <Reedy> Your question is too vague to answer. Hook it up to a pi to do what exactly? [2:15] <u-ou> can the raspberry pi 3 play youtube ok? [2:20] <aScottishBoat> Is it possible to configure the pi to auto login on startup and to launch a browser to a specific webpage? If so, are there resources I can read over? I can't seem to find my answer online. [2:23] <aScottishBoat> ebarch: Thanks pal, I'll take a look now. [2:23] <aScottishBoat> Wow, this is exactly what I need. [2:28] <aScottishBoat> ebarch: what projects have you used the pi for? [2:38] <ebarch> how about you? [2:39] <aScottishBoat> I've barely tinkered with them, although I have a pi zero. We're doing a demo for IoT World (IoT conference soon) doing some IoT stuff using pis. [2:39] <aScottishBoat> So after this I'll have some experience under my belt. [2:39] <aScottishBoat> PiVPN, I'll have to do that. [2:45] <akk> supernovah: Best thing to google for is something like raspberry 3 OR zero headless ... I'm looking for a good link but you may find one as quickly as I do. [2:45] <akk> Or maybe just look at the end of /boot/config.txt, it might have a comment about what lines you need to uncomment. [2:46] <akk> You don't need to run systemd or anything, just a line or two in a file in /boot. [2:46] <akk> supernovah: Okay, hold on, I'll boot one of mine and see what I have. [2:47] <supernovah> do I copy /lib/systemd/system/serial-getty@.service to /etc/systemd/system/serial-getty@ttyAMA0.service ? [2:51] <akk> Oh, I was assume 3 or 0. In that case, sorry, I don't know. I skipped the 2, I only have 1, 3 and 0. [2:51] <akk> I thought the 2 was like the 1 with serial enabled by default, but it sounds like no. [3:07] <ebarch> ... aren't pins 8/10 the UART? [3:53] <derooz> Hey, What's the best way to put together a RPi, a adafruit PN532 breakout board, and a buzzer? Custom print a case and a PCB? [6:35] <u-ou> does the 3 need a cooler? [8:30] <chinztor> so, which OS could be better? [10:00] <luxio> are rpis good for seedboxes? [10:03] <Lartza> SirLagz, It does? [10:03] <SirLagz> Lartza: sure. if your internet connection only uploads at 5mbit, the Pi isn't going to be a bottleneck. [10:05] <SirLagz> Lartza: USB HDD. you aren't going to max out the Pi on a 5mbit upload. [10:06] <Lartza> And do you first download the files onto that HDD on another computer? [10:09] <SirLagz> Lartza: pretty much. [11:57] <wondiws> hi there, is the GPIO output of the RPi(3) capable of providing enough current to sound a PC speaker? [11:58] <gordonDrogon> wondiws, I've driven a 64Ω speaker directly from gpio in the past. [11:58] <gordonDrogon> however I'd not recommend it for anything other than a quick test. [11:59] <gordonDrogon> the 3.5mm jack output is really intended as a line output or high impedance headphones. [11:59] <gordonDrogon> try to keep the current to under 16mA. [12:01] <gordonDrogon> in that video I'm driving a 64Ω speaker directly. [12:09] <gordonDrogon> it uses the softTone module in wiringPi to make the tones, but only plays the tone for 100mS then goes back to scanning the inputs, so it's not perfect, but hey ho. [12:15] <gordonDrogon> I'd not written code to run the pwm in tone mode back then. thats video is almost 6 years old. [12:17] <gordonDrogon> ideally, you change from balanced mode to mark:space mode. [12:42] <Li> I'm trying to interface/debug/commmunicate with serial rs232 port of GEFRAN PLC that works on 24v. I'm pretty sure I'm not supposed to connect directly with USB to TTL but not sure what to do exactly. can anyone help please? [12:44] <immibis> get a USB-to-RS232 converter? [12:48] <gordonDrogon> just make sure the rs232 adapter doesn't say "TTL". [12:48] <gordonDrogon> then it ought to handle the +/- voltages correctly. [12:51] <Li> immibis: what is the difference between the convertor and TTL ,, can you show images for both? [12:52] <gordonDrogon> technically is -3 to -15v and +3 to +15v however who cares about that these days. [12:53] <Li> which one I can use for this task? [12:53] <gordonDrogon> Li, no idea - I am not going to click on those urls. [12:53] <gordonDrogon> Li, why not just read the product specification yourself? If it says rs232 and doesn't say ttl then (in theory) it should be fine. [12:54] <gordonDrogon> if you trust anything from aliexpress that is. [13:04] <Li> UC232A ... they even mentioned working temperatuer and power consumption but not the maximum voltage tolerance! [13:12] <GenteelBen> Li: we'll need more than empty words as an apology. [16:56] <Project86__> I find it disappointing the lack of pi cases made for tft. And why not a single one of them have pop on cover to protect the screen when not in use, is beyond me. [17:01] <Project86__> I suppose I'll have to find a way to access a 3d printer and make my own..
[17:09] <gordonDrogon> can you mount the tft on a protoboard - the use e.g. 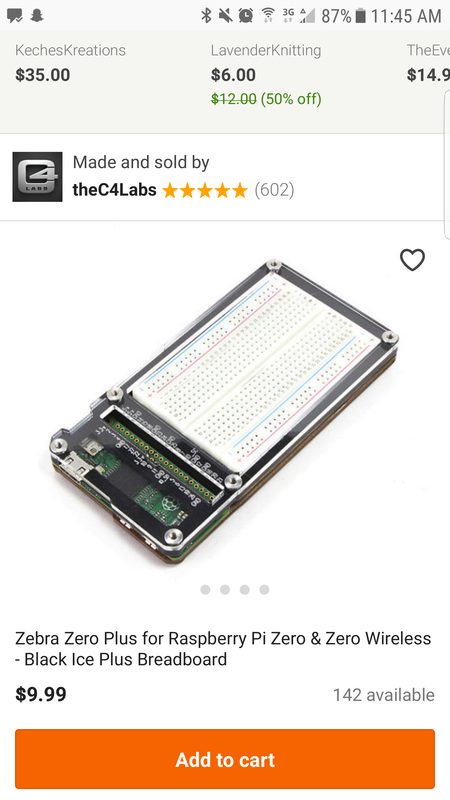 the Pimoroni Coup� case? [19:01] <uriah> so is anyone in here using Bluetooth with a pi3 b rev 1.2? [19:13] <snowzone> uriah: same here but was related to power. chip that did the bluetooth was "underpowered"
[19:14] <snowzone> think the "b" stands for bluetotth and the "+" stands for "? :)orking"
[19:24] <erm3nda> uriah, 10A ?? why? [19:24] <erm3nda> uriah, is not so much at all? [19:27] <snowzone> based on Gentoo? [19:28] <uriah> snowzone: what is your main distribution now? [19:43] <snowzone> "minimal" setup for me is multitail, most, updated version of vim, and python 3.x. [20:06] <Project86__> shauno: speaking of fans, how bad is it to run it directly to gpio? All enclosure instructions and online tuts say just plug it it. But then I read it bad because it draws 5v instead of the 3.3 it should. But if everyone's been doing it all this time, is it honestly that damaging? [20:07] <H__> shbrngdo: gentoo ? [20:09] <shbrngdo> but yeah I understand they were doing it 'that way'. I never did install it. [20:09] <H__> i ran it a few months. years ago. [20:10] <shbrngdo> well there's the 'build-dep' option for apt-get [I think that's the right naming] that gets all of the -dev packages for a particular package, but when you want to create your own, you have to jump through a lot of hoops to get all of the dependent libs, typically. [20:11] <shbrngdo> so if you want gtk-based, you have to do 'build-dep' for gtk [probably] but what you really need is most likely a subset of that but "what subset" ? [20:17] <shbrngdo> in any case, GPIO pins aren't for driving anything. They're not open-drain, they can't sink more than 20ma or so and can't exceed 0-3.3v without damaging something. [20:17] <shbrngdo> if you need to drive something with a higher voltage, then an external MOSFET or transistor [with base resistor] would work. [20:18] <shbrngdo> so the GPIO pin goes to the MOSFET gate (assuming NMOS with source at ground potential), or through a resistor to the base of an NPN transistor (with emitter at ground), and the open drain/collector connects to the 'ground side' of whatever load you're trying to control. [20:18] <shbrngdo> then the transistor/MOSFET would have to be able to handle the voltage/current. [20:19] <red9> I read that the GPIOs are 16 mA maximum? [20:19] <shbrngdo> yeah, I can't recall the exact number, but you might be right. It's a small current. [20:20] <SpeedEvil> shbrngdo: https://www.digikey.com/products/en?FV=ffec0938 wants 20mA@3.3V. [20:37] <gordonDrogon> There is a 5v pin on the Pi's GPIO connector -you can use that to run low-power 5v fans off. Can't turn them on/off though - on all the time. [20:39] <gordonDrogon> shbrngdo, the Pi's GPIO pins can sink or source the same current. there are programmable drivers for them too. [20:40] <gordonDrogon> the Pi's gpio connector has 5v power, 3.3v power and 0v - as well as signal pins. [20:42] <gordonDrogon> there isn't actually a limit on current a signal pin can sink or source, however there are guidelines and limits if you're driving 3.3v logic devices. I've drawn 35mA from a gpio pin in the past. not sure I'd recommend it though! [20:42] <shbrngdo> Project86__ - I think before you start building things you should do an online tutorial on basic electronics. [20:43] <gordonDrogon> the default current drive strength allows for sourcing 8mA while maintaining a logic 1 level to 3.3v devices. [20:44] <gordonDrogon> shbrngdo, might have something on what? I'm pretty au-fait with how the Pi's gpio works. [20:44] <gordonDrogon> and have chatted to Gert about it at length. [20:45] <gordonDrogon> the drivers basically parallel the output drivers. You can set it in steps. [20:45] <gordonDrogon> the drive strength is all to do with being able to maintain a logic 1 for 3.3v devices when sourcing a given current. [20:46] <gordonDrogon> in-general you're recommended to not sink/source more than 50mA though. However I've driven 3x that in the bad old days before these things were talked about. [20:46] <gordonDrogon> that's 50mA over all pins. [20:48] <gordonDrogon> I had a "blimp drone" once. Helium filled envelope with a unit with 2 silly little fans underneath. You adjusted the buoyancy with blue tack. the motors gave forward (and up) or back (and down) or turn. [20:50] <gordonDrogon> the toy I had was purely indoors only. [20:51] <red9> Or just add a compressor for the helium? [20:54] <red9> My idea with the compressor is that with a baloon in one end and a pressure vessel in the other. It's possible to keep the helium and control bouancy. [20:56] <red9> shbrngdo, Is it possible to make a large sub controllable by one person? [20:56] <shbrngdo> for level flight you'd keep a level trim. [20:57] <red9> The WWII subs at least seems to have gauges and controls everywhere. [20:58] <red9> shbrngdo, I thought in a situation where it's only about going from A to B. [20:58] <red9> shbrngdo, All those control levers and no "window" made me wonder if it's even feasible without high level science. [20:59] <shbrngdo> I don't know what more modern subs are doing, but I expect they're operating with more automation, with mechanical backups. It was that way decades ago. When 'reliability' is the #1 concern [particularly in casualty situations] there are backups for the backups, and lowest common denominator is an operator with a set of valves. [21:00] <shbrngdo> Project86__ - sometimes going through a tutorial fills in the blanks. just a thought. [21:01] <red9> shauno, So are there any particulars about subs that makes them hard to manouver or are they just intimidating? [21:02] <shbrngdo> red9 - I'd say the more difficult thing people don't initially get is it's 3D, not 2D. up/down matter. aircraft are similar but you can see the ground. In a sub, you're running on sonar most of the time. [21:33] <wondiws> is there a good python library that supports hardware PWM? [21:41] <erm3nda> did you searched? [21:43] <erm3nda> the someone told that link as "working"